Super Savings Item! Free Shipping Included! 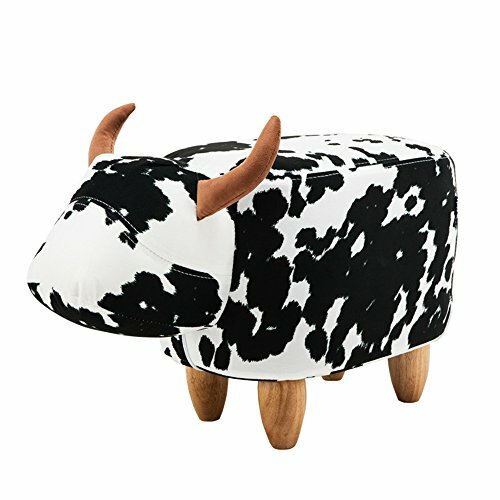 Save 32% on the PIQUU Padded Soft Cow Ottoman Footrest Stool/Bench for Kids Gift and Adults (Black and White) by PIQUU at Indsight. MPN: 43178-162337. Hurry! Limited time offer. Offer valid only while supplies last. Your search for that beautiful yet functional piece of furniture ends here. Introducing the hot new innovation, that has transformed many homes. Your search for that beautiful yet functional piece of furniture ends here. Introducing the hot new innovation, that has transformed many homes. This piece of art is great for different rooms in your house; it compliments other pieces of furniture immaculately. It is made with great looking materials ready to be centre of attraction. The material is not only pleasing to the eye but also it feels incredible. This bench/stool isn't sorely for the purpose of sitting on. Cushioned enough to sit on and plush enough to lie against or play on, this bench is great for kids and super cute as well. Perfect for the kid inside of us all, this ottoman is a must have. Flexible polyurethane foam (FPF) This form is designed for comfort permitting you to use the stool for lengthy hours. Leather skin and wooden legs. These two give the stool an expensive and luxurious look. Excellent Customer Service and After-sale Service We have friendly customer service reps ready to answer any queries you may have about the product. High-end furniture - The luxurious looking leather and wooden legs of this item gives you a new centerpiece to show off. Multi-purpose: Rest your feet after a long day, Use as a stool for your baby, Marvelous educational toy. The list is endless! Quite easy to assemble- It doesn't require any special skills or abilities. An informative instruction manual is included. If you have any questions about this product by PIQUU, contact us by completing and submitting the form below. If you are looking for a specif part number, please include it with your message.